The Doberman Pinscher is an elegant, muscular and very powerful dog. It has a well proportioned chest, a short back and a lean, muscular neck. Its hard, short-haired, close-fitting coat comes in black, black & tan, blue-gray, red, fawn and white. While white markings are considered a fault in some clubs in others it is accepted. The hair is short, thick, hard and tight to its body. Its teeth are strong and close in a scissors bite. Eyes are dark with a lively, intelligent expression. The ears are usually cropped (cut at the age of about 12 weeks). The pup"s ears have to be taped for a couple of months to make them stand up. I believe England has banned the cropping of pup ears and the docking of their tails. Lately, many breeders have left their pups natural. If left natural they develop ears somewhat like a hound. The tail is usually docked at the age of 3 days. If the tail is not docked it grows a tail somewhat like a hound. Its legs are perfectly straight. The Dobermans gait must be elastic, elegant, and cover a lot of ground. 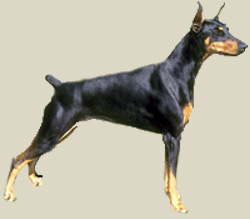 The Doberman pinscher is an intelligent capable guardian, ever on the alert and ready to protect its family or home. It is also a loyal and adventurous companion. It likes to be mentally challenged and is a gifted obedience pupil. It is sensitive and very responsive to its owner"s wishes, though some can be domineering. It is generally reserved with strangers. It can be aggressive with strange dogs. This is an active breed that needs daily mental and physical exercise, lest it become frustrated or destructive. Its exercise requirements can be met with a long jog or walk on leash, or a strenuous run in a safe area. The Doberman can live outside in temperate climates, but it is a much better companion and effective guardian if it shares its human"s home. Coat care is minimal.